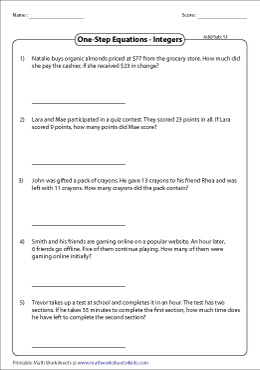 This page encompasses a compilation of worksheets on one-step equation word problems that are custom-made for learners of grades 6, 7, and 8. One-step equation word problems with coefficients involving integers, fractions and decimals are incorporated here. Use the real-life word problems to assist students improve their analytical thinking. 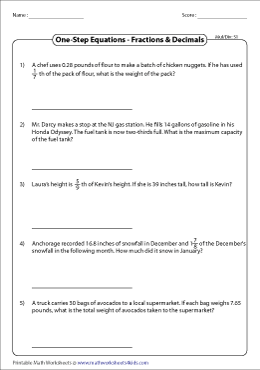 Read each of the 15 word problems spread over three worksheets. Get students to frame one-step equations and apply either addition or subtraction operations to find the value of the unknown. Frame equations with fractions and decimals. Solve the equation and find the solution. 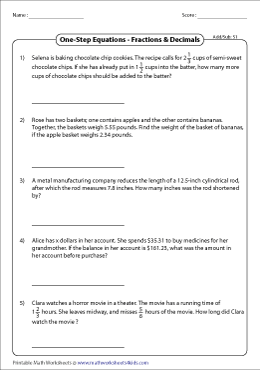 This series of word problems helps students grasp the basics of one-step equations. Read each word problem and interpret them into one-step equations. To isolate the variable from the equation, multiply or divide an integer on both sides. Use the answer key to verify your responses. Use multiplication or division operations to solve the obtained equation. Test a student's comprehension in forming one-step equations with word problems that feature an assortment of fractions and decimals. Read the word problems that comprise a mix of integers, fractions and decimal numbers attentively. Choose the one-step equation that best matches the scenarios given here.